About this Protect - E - Lope:Document folder fits 8.5" x 11" paper.Secure snap closure.Material: Polypropylene.Special Instructions:1 Day Rush, available upon request for 1 color, 1 imprint location orders. About this The Associate Ringbinder:1" metal three-ring binder includes refillable lined notepad.Inside front panel contains flap pocket with 3 horizontal pockets.Includes 30 sheet ruled notepad and pen loop.Material: UltraHyde.Special Instructions:1 Day Rush, available upon request for 1 color, 1 imprint location orders. About this Take - Away Folder:Bold color PP folder with double interior pockets.Durable and stylish for document presentation or organization. About this PolyPro Folder:This easy to carry folder is a simple way to store documents and take notes to and from meetings. Folder with interior document pockets. Interior mesh pocket and pen loop. Elastic band closure. Includes 8-1/2"w x 11" writing pad.Material: PP (Polypropylene) Plastic. About this Linen Paper Folder:The Linen Paper Two-Pocket Presentation Folder features an array of colors to showcase your company logo. Handy, universal business card slots on the inside...Available in 7 colors.Universal business card slot on inside.Material: Linen paper. About this Full Color Paper Folder:Full color printing designed by you - unique to you. Handy, universal business card slots on the inside...Full color printing on entire one side of the folder.Universal business card slot on inside.Material: 12 pt paper. About this Junior Portfolio:Keep all your important notes in one place!Made with recycled soft vinyl, each large capacity Junior Portfolio fits 8 1/2" x 11" documents flat and is a great choice for banks, insurance companies and car dealerships.Material: Vinyl NOTE: Product comes with Prop 65 warning label. Label reads: "WARNING: This product may contain carcinogen, which is known to the State of California to cause Cancer and Reproductive Harm. For more information, go to www.P65Warnings.ca.gov. About this Super Value Portfolio:Oversized soft vinyl portfolio.Fits both 8 1/2 x 11" and 8 1/2" x 14" documents flat.Made with recycled material.Material: Vinyl NOTE: Product comes with Prop 65 warning label. Label reads: "WARNING: This product may contain carcinogen, which is known to the State of California to cause Cancer and Reproductive Harm. For more information, go to www.P65Warnings.ca.gov. About this Auto Document Holder:Let this customizable auto document holder be the "driving" force behind your next promotion!Ideal for insurance companies, rental car and car dealerships, this soft vinyl holder will keep important documents organized and protected.Made of recycled materials, features include 2 business card pockets on the flap and plenty of room to fit letter size papers folded in half.Offered in several colors to meet your brand.Proudly made in the USA.Material: Vinyl NOTE: Product comes with Prop 65 warning label. Label reads: "WARNING: This product may contain carcinogen, which is known to the State of California to cause Cancer and Reproductive Harm. For more information, go to www.P65Warnings.ca.gov. About this Auto Document Case:Customers will drive your logo all over the map using this custom auto document holder!Ideal for insurance companies, rental car and car dealerships, this soft vinyl holder will keep important documents organized and protected.Made of recycled materials, features include 2 business card pockets on the flap and plenty of room to fit legal size papers folded in half (8 1/2" x 11" and 8 1/4" x 14").Proudly made in the USA and always in stock!Material: Vinyl NOTE: Product comes with Prop 65 warning label. Label reads: "WARNING: This product may contain carcinogen, which is known to the State of California to cause Cancer and Reproductive Harm. For more information, go to www.P65Warnings.ca.gov. About this Lamis Standard Folder:Soft Litchi fabric accented with stitching.30-page, lined writing pad.Inside pockets, card holders and pen loop.Magnetic snap closure. NOTE: Product comes with Prop 65 warning label. Label reads: "WARNING: This product may contain carcinogen, which is known to the State of California to cause cancer. For more information, go to www.P65Warnings.ca.gov. About this Letter Size Pad Holder:For the busy professional, meet your new sidekick for a business meeting or seminar!This classic Letter Size Pad Holder is made of soft vinyl and features include a board-backed hard cover, an 8 1/2" x 11", 40 sheet lined pad of paper, inside flap pocket and business card slot.The cover is offered in several colors to catch their eye and draw attention to your logo.This product is made in the USA and is always in stock!Material: Vinyl NOTE: Product comes with Prop 65 warning label. Label reads: "WARNING: This product may contain carcinogen, which is known to the State of California to cause Cancer and Reproductive Harm. For more information, go to www.P65Warnings.ca.gov. About this Standard Document Case:Make a convincing "case" for your brand!Made of soft vinyl, keep your important documents safe in this customizable case.The left side features a multi-use inside open flap pocket, while the right has a second inside open flap pocket and business card slot.Great for banks, insurance companies, tradeshows and much more, each cover is offered in several colors.Material: Vinyl NOTE: Product comes with Prop 65 warning label. Label reads: "WARNING: This product may contain carcinogen, which is known to the State of California to cause Cancer and Reproductive Harm. For more information, go to www.P65Warnings.ca.gov. About this Junior Size Desk Folder:This handsome padfolio will look great with your logo!Measuring 5 5/8" x 8 3/4", the Junior Size Pad Holder's compact size is perfect for note-taking in the office or on the go.The classic design is made of vinyl with a board-backed hard cover and features a lined pad folio with 5" x 8" pad of paper (40 sheets), inside flap pocket and business card slot.Offered in a rainbow of colors, this USA-made product is 100% reusable and always in stock.Material: Vinyl NOTE: Product comes with Prop 65 warning label. Label reads: "WARNING: This product may contain carcinogen, which is known to the State of California to cause Cancer and Reproductive Harm. For more information, go to www.P65Warnings.ca.gov. About this Mini Multi - function Document Holder:Multi-function mini document holder with four internal folders, perfect for organizing photos, receipts, tickets, etc.Includes one slide-lock clear zipper pocket.PP construction, clear cover with color-accent folders. About this Junior PP Folder with Writing Pad:Jr. size 0.65 mm Polypropylene folder with open front interior pocket on left side and writing pad on right side.Notepad with approx. 30 lined sheets.Notepad may be refilled with those from your local office supply store, approx. size: 3.75"w x 7"h.
About this 2 Glued Pocket Folder with Slits on Both Sides - Paper Products:Presentation folder with two glued pockets.BOTH pockets have slits for inserting business cards.Heavy 14 pt. high density white paper board.Liquid laminated front for a high gloss finish and uncoated back.A high quality product for a large variety of business uses.Material :14 pt. high density white paper board.Special Instructions:This picture may reflects a four color imprint and additional fees need to be applied. Minimum 250 for Four Color Process. About this 2 Glued Pocket Folder with Slit on Right Side - Paper Products:Presentation folder with two glued pockets.RIGHT SIDE pockets has a slit for inserting a business card.Heavy 14 pt. high density white paper board.Liquid laminated front for a high gloss finish and uncoated back.A high quality product for a large variety of business uses.Material :14 pt. high density white paper board.Special Instructions:This picture may reflects a four color imprint and additional fees need to be applied. Minimum 250 for Four Color Process. About this Tinley Wire Clip Folder:The Tinley Wire Clip Folder brings the clipboard up a couple notches with simulated leather, wire clip folder with stitched, padded cover, pen slot, writing pad, 2 business card holders, and 1 file pocket. Color available in black. NOTE: Product comes with Prop 65 warning label when shipped to California. Label reads: "WARNING: This product may contain carcinogen, which is known to the State of California to cause Cancer, birth defects or other Reproductive Harm. For more information, go to www.P65Warnings.ca.gov. Free ground shipping to any one continental USA location only. For any other additional locations or non continental USA locations please call for a quote. About this Bridgeport Clipboard with Calculator Clip:The Bridgeport Clipboard with Calculator Clip is so practical it's the best promo to add your brand logo to! This item is perfect for trade shows, conferences, organizational use, contractors, builders, inspectors, any job that needs a calculator in hand all the time. NOTE: Product comes with Prop 65 warning label when shipped to California. Label reads: "WARNING: This product may contain carcinogen, which is known to the State of California to cause Cancer, birth defects or other Reproductive Harm. For more information, go to www.P65Warnings.ca.gov. Free ground shipping to any one continental USA location only. For any other additional locations or non continental USA locations please call for a quote. About this Roseland Letter Size Clipboard with Clock:This Roseland Letter Size Clipboard with Clock is a great promotional item for an organizations, home builders and construction, trade shows or conferences. Very practical for everyday office and work usage, the built in time clock makes working more efficient especially for contractors and to keep people in time for their meetings. NOTE: Product comes with Prop 65 warning label when shipped to California. Label reads: "WARNING: This product may contain carcinogen, which is known to the State of California to cause Cancer, birth defects or other Reproductive Harm. For more information, go to www.P65Warnings.ca.gov. Free ground shipping to any one continental USA location only. For any other additional locations or non continental USA locations please call for a quote. About this Square Mailer - Paper Products:Send your mail in style with a customized mailing envelope.Heavy 14 pt. high density white paper board.Liquid laminated front for a high gloss finish and uncoated back.A great way to ship in style while promoting your company!Can be fully customized!Material :14 pt. high density white paper board.Special Instructions:This picture may reflects a four color imprint and additional fees need to be applied. Minimum 500 for Four Color Process. About this Self Locking Packet Folder - Paper Products:Unique self locking packet folder.Made from heavy 14 pt. high density white paper board.Liquid laminated front for a high gloss finish and uncoated back.Unique office product with a variety of uses.Material :14 pt. high density white paper board.Special Instructions:This picture may reflects a four color imprint and additional fees need to be applied. Minimum 250 for Four Color Process. About this Certificate Holder - Paper Products:Certificate Holder. Heavy, 14 pt., high density, white paper board. Liquid laminated for a high gloss finish and uncoated back. A high quality product for a large variety of business uses.Pockets are not glued to allow for expansion.Material :14 pt. high density white paper board.Special Instructions:This picture may reflects a four color imprint and additional fees need to be applied. Minimum 250 for Four Color Process. Thank you Lisa, Lynn, and Gail. We’re glad to read your reviews. Our Letter Size Document Envelope is on our Top 100, because it is great for any event! The Letter Size Document Envelope could be used for any company, whether giving them out to guests at an event, or placing important papers for employees. Our envelopes will help your guests, customers, or employees stay organized. Thank you Cameron and Marcus! Our Protect-E-Lope is great for conferences. Guests will love to store away important information inside of these. The Protect-E-Lope is a great item for everyone. 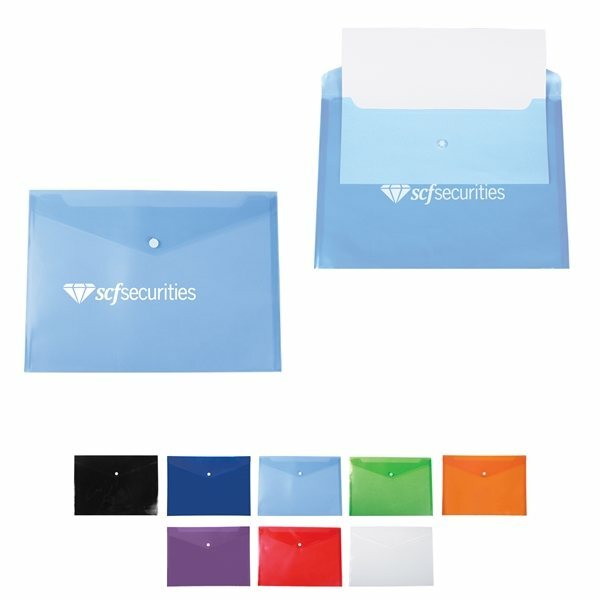 Envelope folders have become popular for companies to giveaway because of its convenience. It helps store away important information in a neat manner. Document folder fits 8.5" x 11" paper. Thank you Marissa and Janessa! Our 2 Pocket Folder is great for all events! Company information should always be kept organized, so why not give your guests or employees the 2 Pocket Folder? Letter size 2 pocket folder for reports, presentations and keeping organized. Made of 0.3 mm Polypropylene. Features small clear pocket on each of the interior pockets designed for inserting business cards or contact information. Holds approx. 30-60 A4 and letter size sheets. Available in black, reflex blue, red, lime green, purple. Order your 2 Pocket Folder here. With a wide selection of Binders & Folders available, your promotional item could just be a few clicks away. Binders and folders are great to keep you organized. We have large file folders, portfolios, conference folders, 3-ring binders, calculator folders, and many more! Our binders and folders are made for any event, for any customer. Ever feel like your papers are all over the place? Well, our binders & folders are your solution! 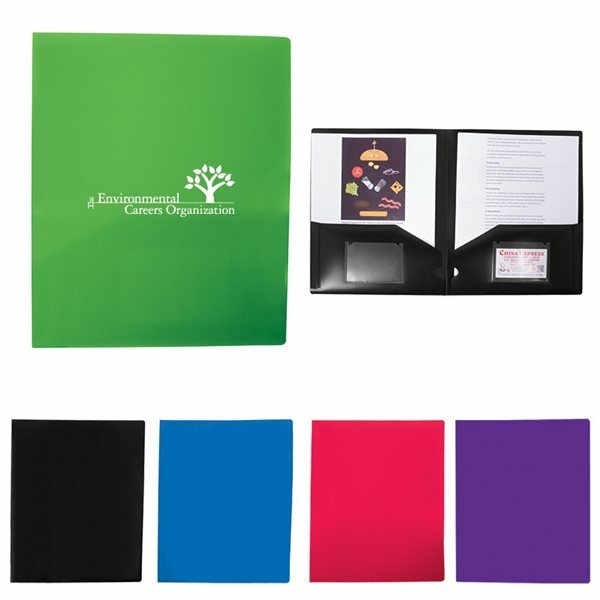 Get organizing with our selection, put your papers in an orderly fashion with our promotional binders and folders. You’ll want to take them all! Use binders and folders to represent your company at meetings. Give these to students with their school logos! Look through our selection of binders and folders. Shop here! At AnyPromo, we place a high standard on brand impact, just like our customers. Search our site for a wide selection of custom binders and folders, and see for yourself. Registered trade show guests are bombarded with branded swag at every moment, so it is extremely important to stand out. Our binders, folders and more are high-quality, specially priced, and proven to generate impressions. Click through our inventory of event binders on sale now. The following list of hot items is a snapshot of our selection of 60 choices of custom binder products. We’d love to help expedite your order, so give us a call! Grab your promo binder and folder swag today! 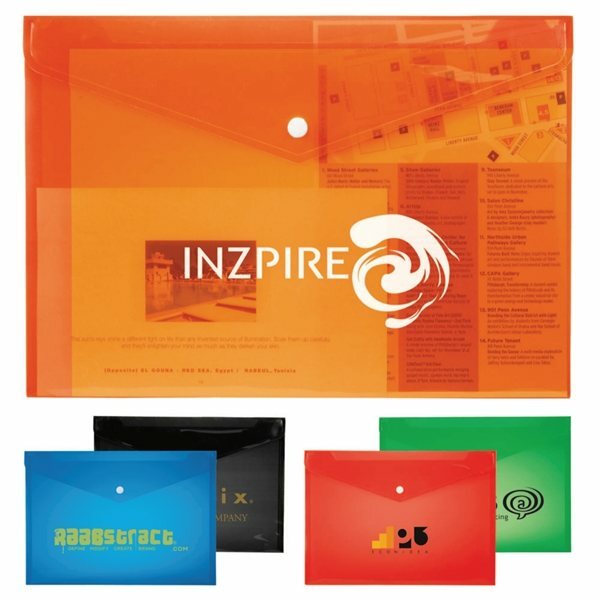 Binders and folders are great promotional items for educational institutions, businesses, trade shows, and more. Your opportunities for binders and folders are endless. Exhibiting at a trade show? Give your guests a clipboard folder to take notes with during the trade show. They’ll be walking around with your promotional item. Our featured list of binders and folder are for everyone! When it comes to office supplies, customers love to receive them. Don’t miss out on these hot and trending items.